A celtic inspired, skull designed by the Design Clinic studio in Cornwall. 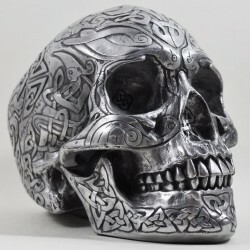 Cold cast resin with silver finish resulting in a weighty skull. Will arrive in a Design Clinic box.